As a Texas Children’s employee, you have the privilege and the responsibility of representing yourself, your department, and most importantly the Texas Children’s brand consistently and professionally through each and every interaction – including your emails. The messages we send via email create important lines of communication and touch points with co-workers, business contacts, community representatives, patients and their families, and many others. 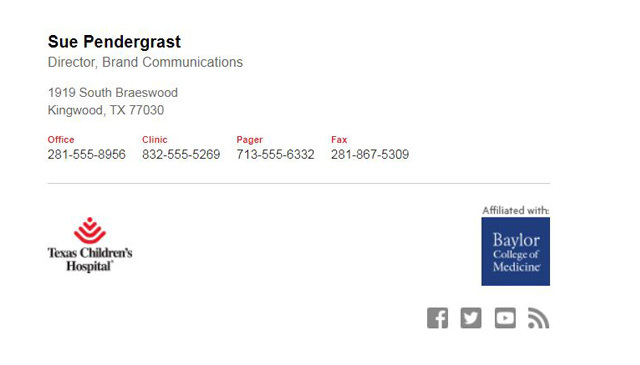 To help you better refine this communication channel, a new email signature generator tool has been developed that allows employees of every Texas Children’s entity to create a branded email signature. Signature instructions and guidelines and a link to the email signature generator tool can be found here. You also can find step-by-step details on how to set up a new signature in the email signature generator tool and how to save the signature in Outlook. The tool features an option to include the Baylor College of Medicine logo, if you are affiliated with Baylor. Do not include unapproved elements in your signature such as colored text, irregular fonts or formatting, pictures, or quotes. You are not required to use a Texas Children’s logo or social media links in the signature of your Texas Children’s email. However, if you choose to use a logo or social media link, you can only use approved Texas Children’s logos found in the email signature generator tool. Note: When pasting the signature into the Outlook “Signature and Stationery” setting, the formatting might appear altered. However, if you click “Save” then “OK” in the Outlook Mail tab as noted in the instructions, the signature should display correctly in any new emails. For more information or if you have any questions, please contact brand@texaschildrens.org. And, thank you for participating in something aimed at making us all better communicators on behalf of Texas Children’s.